Omphalotus is a fascinating genus, widely distributed over the globe. Although morphology of the genus is more variable on other continents, the single local species is readily recognized by it's rich orange to reddish-orange overall coloration (often developing olive or green hues), deeply decurrent gills, dingy orange-gray or olive-gray flesh, growth on wood, often off-center stipe, and white spore deposit. All Omphalotus are decayers of dead wood. The fruitbodies of all members of this genus are bioluminescent! The reaction is best seen on mature, fresh fruitbodies in a very dark room - let your eyes adjust and eventually you should see the gills glowing faintly green. The glow produced by other species around the world is much brighter. 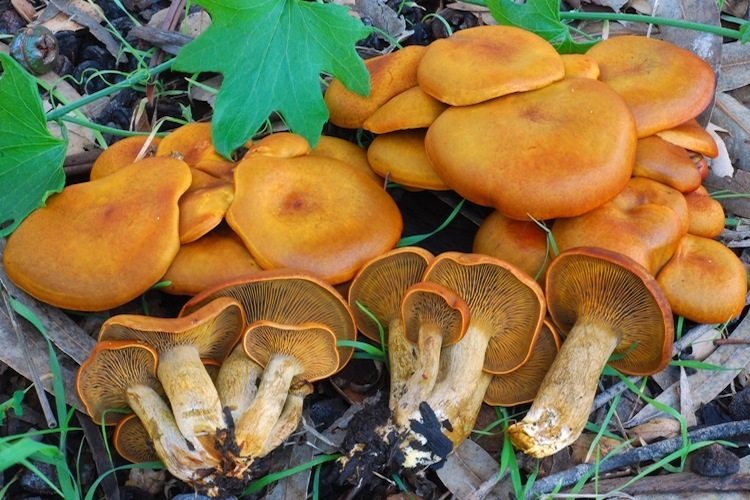 Important identification characters are those used to separate the genus from other orange wood decayers - Gymnopilus have more central stipes, cobwebby partial veils, rusty brown spore deposits, and more fibrillose caps. Although at one point in California history this toxic species caused a significant numbers of poisonings due to confusion with chanterelles, modern field guides have mostly eliminated the problem since the two genera differ in almost every respect (other than decurrent gills).